I love mixing trends with classic pieces. And it doesn’t get any more classic chic than the perfect pair of luscious leather riding boots! This post is a collaboration with Jambu. All opinions are my own as always. Made of full grain tumble leather, these classic beauties will be a wardrobe staple you reach for again and again. 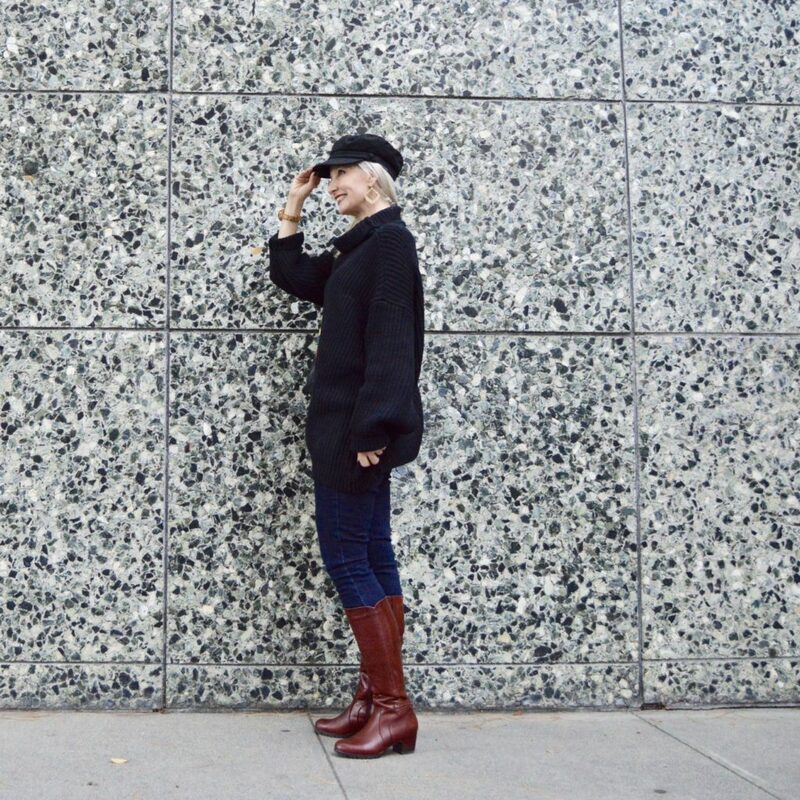 If you’ve been following my posts this fall, you already know that Jambu has the most comfortable boots for women. These Chai boots are made for comfort with a memory foam footbed and 2.16 inch heels with a 1/2 inch platform. The All-Terra outsole and SATRA water resistant certification make the Chai boots perfect for walking in the fall and winter weather. I’m sure these cozy, comfortable, gorgeous boots are what you will be wearing all season long! Check out the deep black and the luxurious “whiskey” reddish-brown shade. I’m also wearing my trendy new Topshop Baker Boy cap. Are you a fan of this trend? It reminds me of the late 80’s/early 90’s with captain caps were in vogue. I’m loving it! I’m also wearing my oversize Free People “In Too Deep” sweater with Old Navy jeans, Kendra Scott Lacy earrings, and my Jord Cassia watch. The Oryany bag is an old TJ Maxx steal. My featured look from last week is Jessica of Elegantly Dressed and Stylish! She is rocking those Jambu Anita booties that I love so much! Now let’s share some style inspiration! Great boots! I hate this season but it’s finally boots weather! Fabulous look. The combo of whiskey and blue is awesome and refreshing take on a classic ensemble. Thanks for sharing your creativity and for the link up. I hope that you have a wonderful weekend. You can’t go wrong with a classic pair of boots. They’ll last forever. Such a gorgeous rich colour too. And you just look adorable in that baker boy hat! I love hair you paired the tan riding boots with your all black outfit. I really need to give Jambu a try, I need some comfortable booties. Your sweater looks so cozy! I love that hat and that JORD watch is gorgeous. I’ve been keeping my eye on it. Wow hon, I love those boots and the hat. You look so cute with great styles. Love these riding boots! The added hat is so chic too. Thanks for the link up! Such a great, classic boot. Loving that rich brown color. such a great boot! Love the color!!! Love the rich brown color of your boot. Two of the best things about fall are big sweaters and boots!! Thank you for hosting. Too cute! Love that hat! Your boots are fabulous! I love how you styled them everything from the over sized sweater to the cutest hat! Oh how I love Free People and my Old Navy jeans are my absolute favorites. Crazy…they’re so affordable and soooo comfortable. Win-win! Love the boots with this combo. Perfect! Thank you Dawn for the feature. I love these boots and we picked the same styles! Your outfit is adorable and the cap looks so good on you! if i only i looked good in hats! Dawn I love your hat and boots! Looking chic as always!! Love this outfit, those boots are fabulous!!! Dawn Lucy, those boots are so gorgeous! I love the rich color. And you look adorable in this cozy sweater with skinny jeans. Such a great fall look for any occasion! You look Fabulous! The Bakersboy cap is the perfect way to top it all off. Loving that cap! I adore those boots too! Such a beautiful color! I absolutely love the color of your boots! They are such a classic style, so you will definitely get a lot of use out of them. Plus, that sweater looks so comfy. I could totally see myself wearing this.